Some may call it the process, I call it stressful, but I’m having so much fun teaching my two boys Mason 6 and Noah 4 how to be safe and controlled dirt bike riders. Before I was a Dad I didn’t know if I wanted my kids to ride dirt bikes because of the highs and lows that I have had in my racing career. Once Mason “my 1st son” was old enough to watch Dad ride and see my bike in the garage I think I was more excited for him to enjoy riding then he was. I didn’t know when I was going to pull the trigger on purchasing a PW50 for Mason but at some point I knew I wanted to. With out knowing I started the process with Mason riding his bicycle at 2 years old with out training wheels. He loved riding his bicycle but never really pressed me for a dirt bike so we just enjoyed riding bicycles in the park and the pump track that I had built. Fast forward a year and my good friend Mike Diorio tells me to come get his sons old PW50 or he was going to sell it. I was torn because my plan was to present Mason with a PW50 for a birthday or Christmas present but it wasn’t going to work out that way because it was June and Christmas and Mason’s birthday were months away. Sarah and I had already got Mason pants and jersey for his 3rd birthday so when I brought the bike home for him he was quickly jumping into his gear and I was left going Uh OH!!! I didn’t know how I wanted to teach him how to ride yet so I thought the best thing to do would be to take him to my neighborhood park and let him ride around the grass paddock so when he had a tip over he would be safer. I turned in the throttle limiter as far as I could so Mason couldn’t go very fast, but to be honest it’s almost harder to ride when the bike is slow because the kids balance really has to come into play when they are going slow. We spent a few days in the park before I took him to the dirt and when I say dirt I didn’t take him to the track. In my opinion the track is very overwhelming with jumps, deep soil and other riders at all levels. Before I hit the track I rode in a turn track and oval in a field behind my house, so Mason could really understand how to use the throttle and brake. He was catching on very quickly but he was scared to go fast and at the speed he was going it was almost harder because he had to balance on his own. To get his speed up so it would be easier on him I took him to a larger field that we could go in a straight line for a longer period of time to understand that going faster made it easier. This worked like a charm and the next step was track. I took him to Pala raceway on a Friday afternoon where he rode the 50 track for hrs with a grin on his face and mine! Mason is 5 years old at this point and he was going faster and faster and this is where things get tricky. The PW50 in my opinion the best motorcycle to learn to ride but it quickly becomes scary due to suspension limitations. This is when my Dad comes into the picture. I started my racing career on PW50’s and back in the 80’s when Dad’s had to hand make modified 50’s to stand the abuse when kids got faster and more aggressive. Did Mason need more power? No! but some more suspension would be nice. My Dad purchased a blown up PW50 off Craigslist stripped it down and ordered some parts from PW50only.com that he thought would build the next step for Mason to be a safer better rider. The chassis was first so he purchased the single shock kit, aftermarket front forks, wider foot pegs, top triple clamp, and renthal bars. For the motor my Dad put a FMF pipe, QT70cc big bore on it utilizing the stock carb with a aftermarket uni filter to help it breathe. One of the biggest things you can do to a PW50 is put Dunlop 3s tires on the bike. After getting the bike on its wheels we noticed that the forks were way to stiff and since these forks are not the latest in technology we just took a fork spring out to help balance the bike out. This seemed to be a good fix as the balance was better and it would give Mason good comfort. Mason loves his “mod bike” and his confidence went through the roof as soon as he got on it. Mason hadn’t raced yet and I thought the best place for his 1st race would be the mini TT at The Day In The Dirt Thanksgiving weekend 2016. The track had no jumps, no bumps and lots of entry level riders. Mason had an absolute blast, rode his little heart out and was smiling for hours after he finished raced. Months later Mason rides maybe once a month and hasn’t raced since his 1st race, but when he wants to ride we go to the track and share his moto stories while his little brother Noah that is 4 years old is riding Masons 1st stock PW50. If you are reading this you are probably wondering why I didn’t just buy Mason a KTM mini 50sx for his 2nd bike? 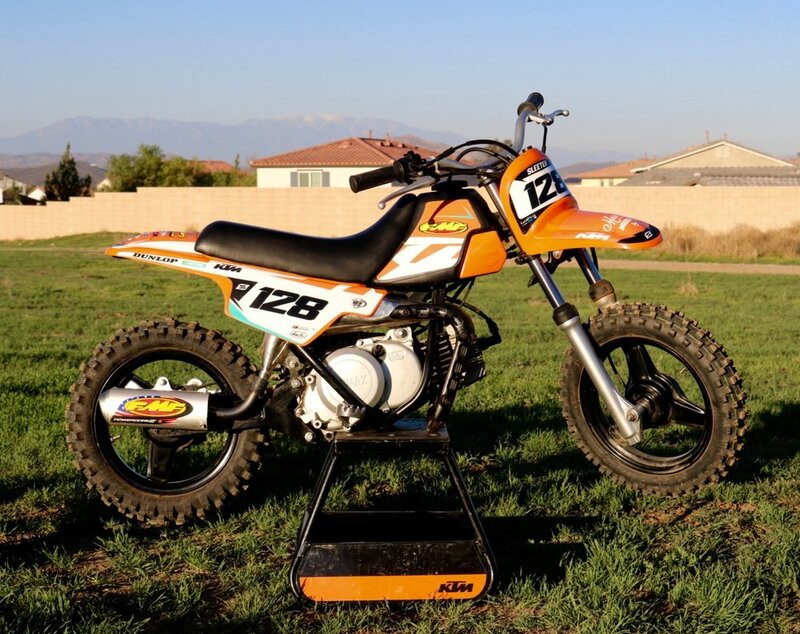 Well the 50sx mini is an amazing bike and I cant wait for Mason to transition to it, but for a 5 and 6 year old it’s a massive gap from the PW50. The KTM has a strong hit off the bottom and enough power to jump a sx triple if the young rider were to whiskey throttle. I’m not saying there aren’t 5 and 6 year olds that make that bike work, but my 5 year old needed more time to develop and Dad needs to save his pennies. At the end of the day I think I think riding motorcycles with your son is one of the coolest things I’ve ever done. 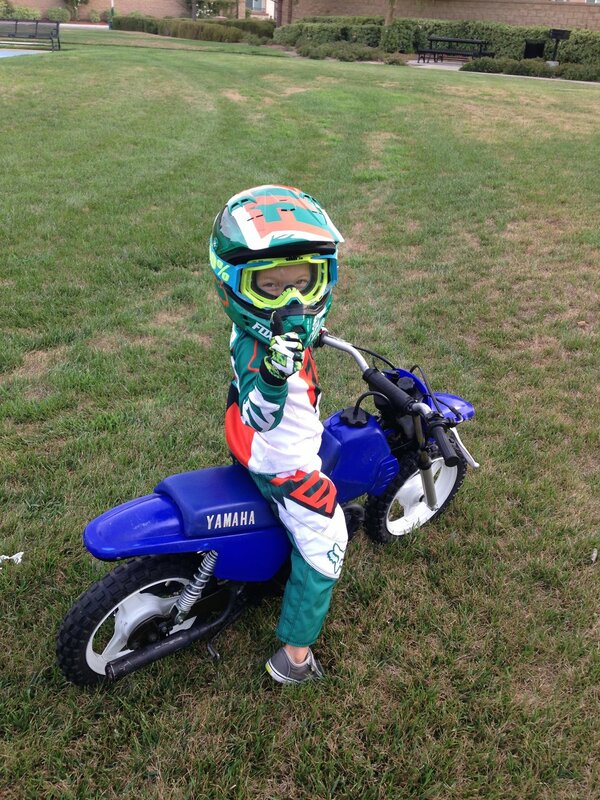 Will my kids have the same passion for dirt bikes that I do? I don’t know, but if they want to ride I want to make sure that they are prepared, safe and understand that riding like an idiot does nothing for you. If you are getting your son or daughter into moto I hope my experiences will help you enjoy in what my opinion is the best sport ever.